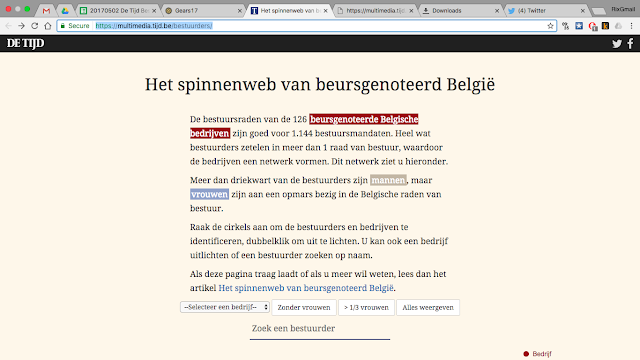 The title of the article is "The Spider's web of publicly traded Belgium", referring to the web of companies, ceo's, chairmen and directors for the 126 public companies that Belgium still has. 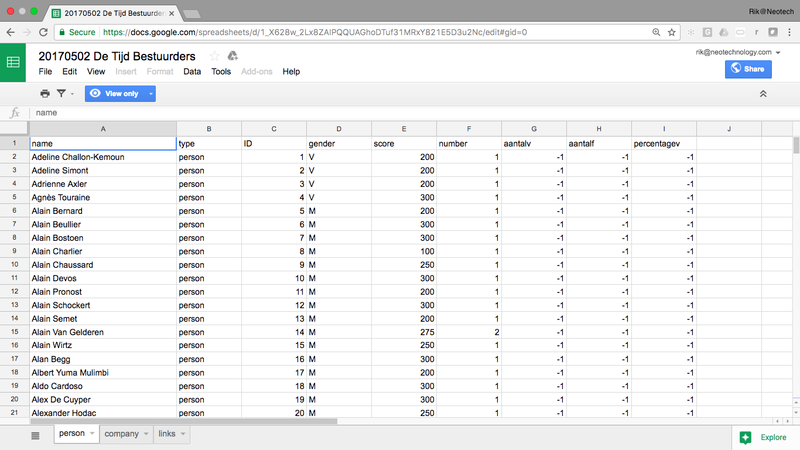 querying the dataset, and finding some new interesting insights (if at all. So the data of the above visualization had to be coming from somewhere, right? I had a similar experience last year when I was looking for the dataset of the Paris Bataclan Terrorist Attack network, which I wrote about on this blog too. 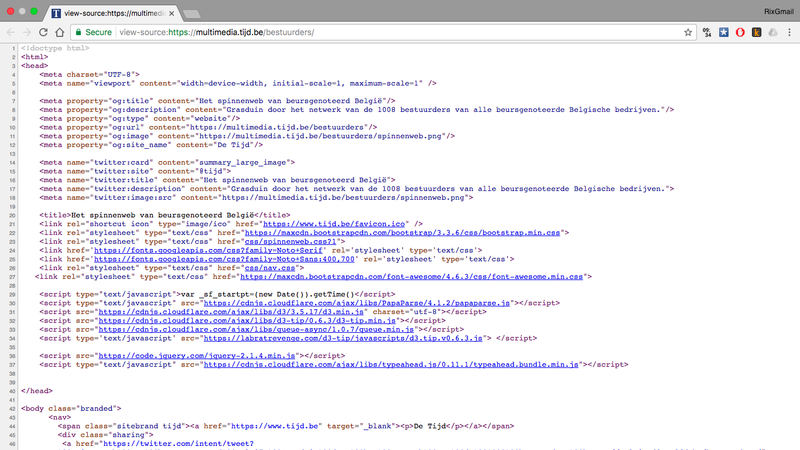 The key of course, is to dig up my HTML-reading skills, and look at the source of the webpage. 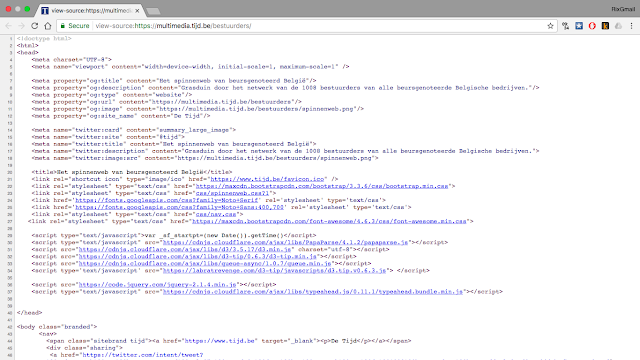 In Chrome just do view-source:https://multimedia.tijd.be/bestuurders/ and it will show you the page. tag which is actually located over here. Let's look at that file for a second. 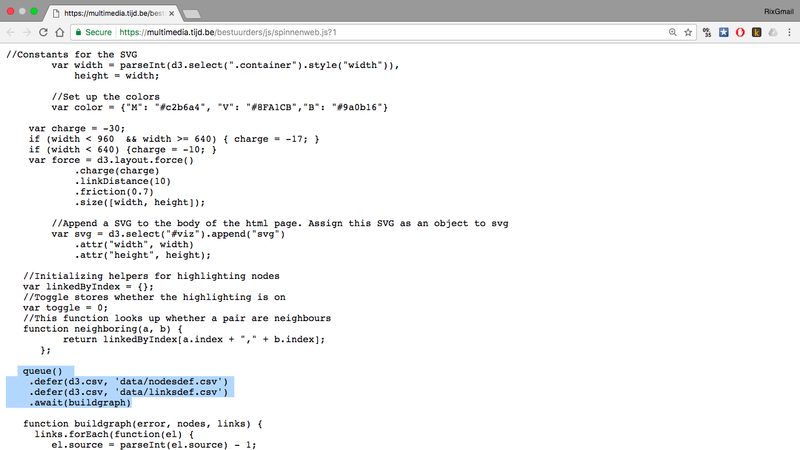 So now we can think about loading that .csv data into Neo4j. Been there, done that! the Persons sheet. As always, you can make the spreadsheet publicly accessible, and then the Persons sheet can be downloaded as a csv file from a specific URL. 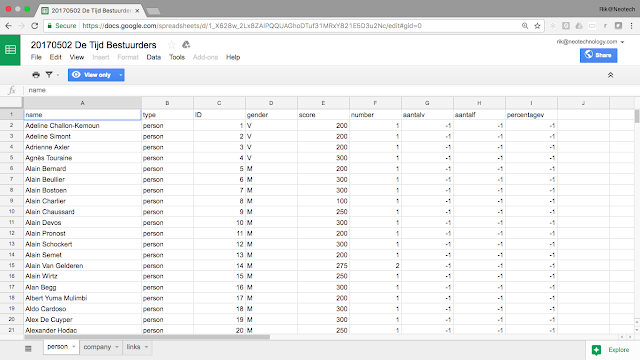 last but not least: the relationships between Persons and Companies can also be downloaded as csv file. This latter file is interesting, as it references different types of relationships. This means we can import the data in different ways, as we will see below. 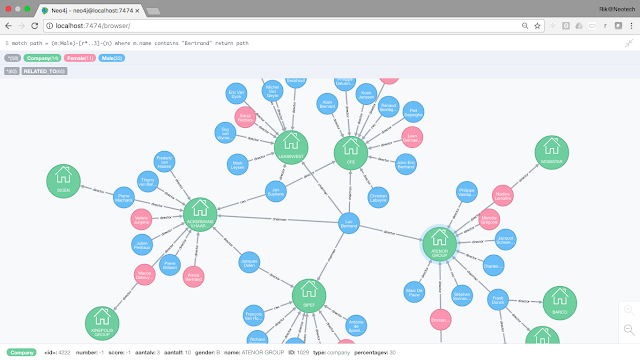 So now that we have these three slightly modified CSV files, we can proceed and use Cypher's LOAD CSV to import the data into Neo4j. Let's do that. add the relationships between both of the above. we are assigning two Labels to the nodes here. After the import, we will only want the :Person label, but during the relationship import we will want to use the ID of both the Person and the Company nodes to establish these links. with the SET command, I am just assigning all the properties / columns of the csv file to the newly created notes - in other words I am not selecting any of them specifically. And Neo4j reports to have created 127 Companies. we can create a model that has one generic "RELATED_TO" relationship type, but then qualifies the relationship with a relationship property. Both options could be valid, and I have implemented both. This works with standard Cypher, and gives you a quick and easy result. As I said, there's really not that big of a difference - both are possible. 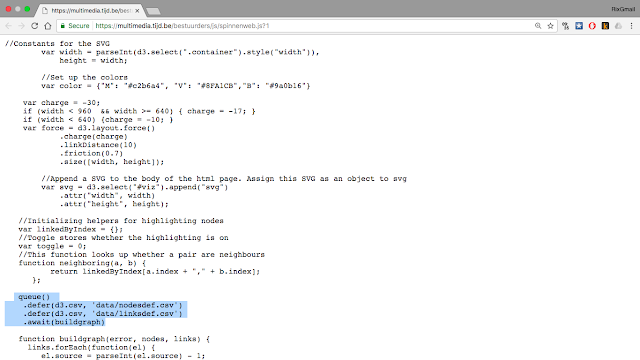 And lastly, I could also remove the :Node label now - no need for that anymore. We will explore this lovely little graph in the 2nd and final part of this blogpost, soon. Hope you enjoyed - look forward to hearing your feedback. All of the scripts are on github, you can find them over here.